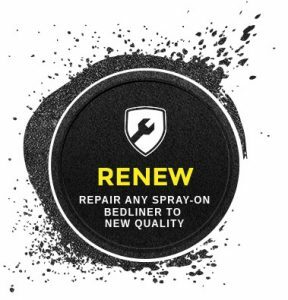 LINE-X® ReNew is a bedliner enhancement system that can repair old, faded, or gouged spray-on truck bedliners. Over time UV light can damage a bedliner, causing it to steadily fade. LINE-X® ReNew returns your bedliner to its original luster while helping to minimize future UV damage. This proprietary surface treatment adheres to any existing polyurethane and polyurea coating, completely resurfacing the damaged area. A worn-out bedliner can be restored to original condition, plus UV resistance for further protection.